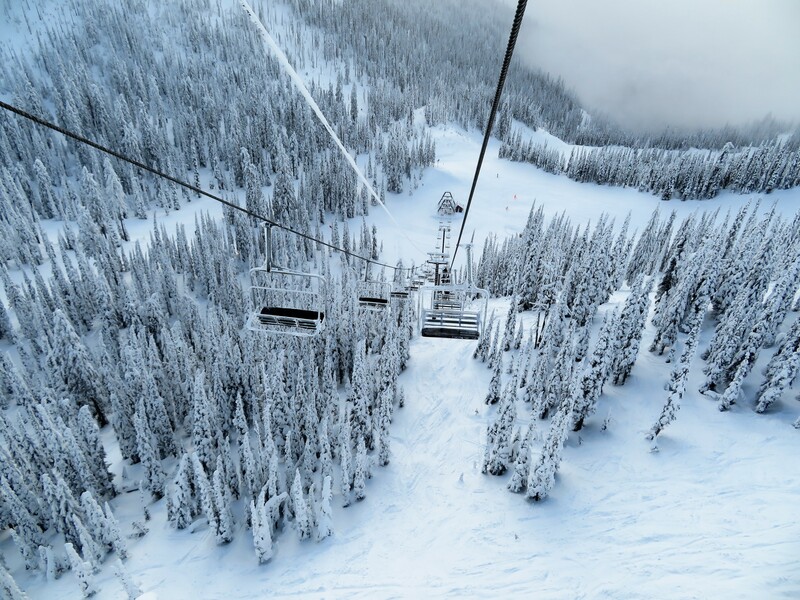 A 35-year old chairlift is proving very popular in Whitefish, Montana this season after moving from an alignment redundant with other lifts to an underutilized corner of the mountain. Exactly half of the 14 lifts at Whitefish Mountain Resort stand in a second location, with some even finding a third home in Northwestern Montana. 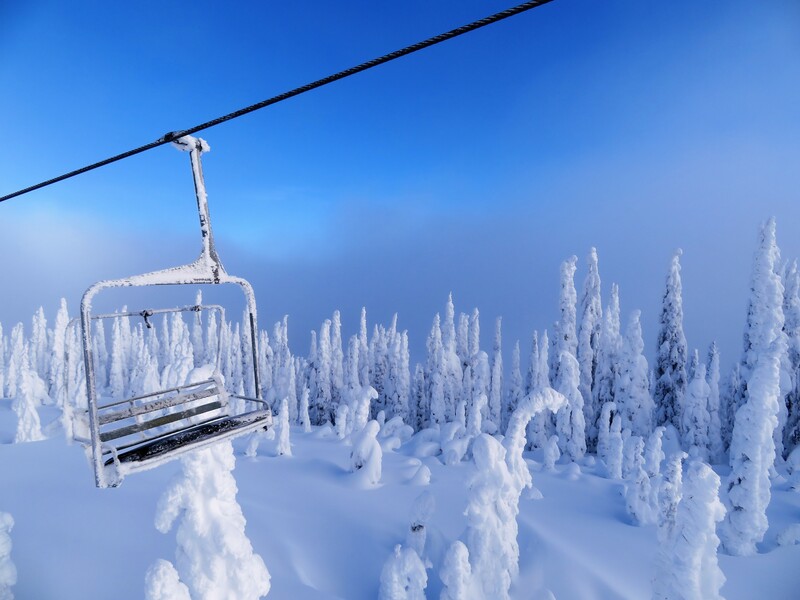 By strategically re-engineering and relocating lifts from elsewhere on the mountain and beyond, Whitefish has been able to grow faster than many of its competitors and now encompasses 3,000 acres of glades, groomers and chutes. 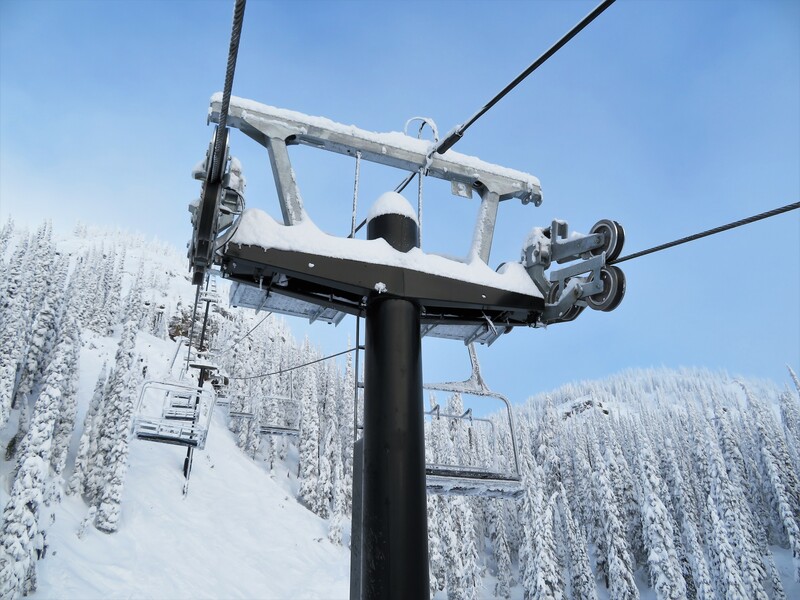 This year’s move of Chair 5 creates the East Rim lift and turns a machine that sat idle for years into a dedicated lift for some of the finest advanced terrain in the Inland Northwest. For the first 50 years, every lift on Big Mountain was purchased new from a manufacturer. 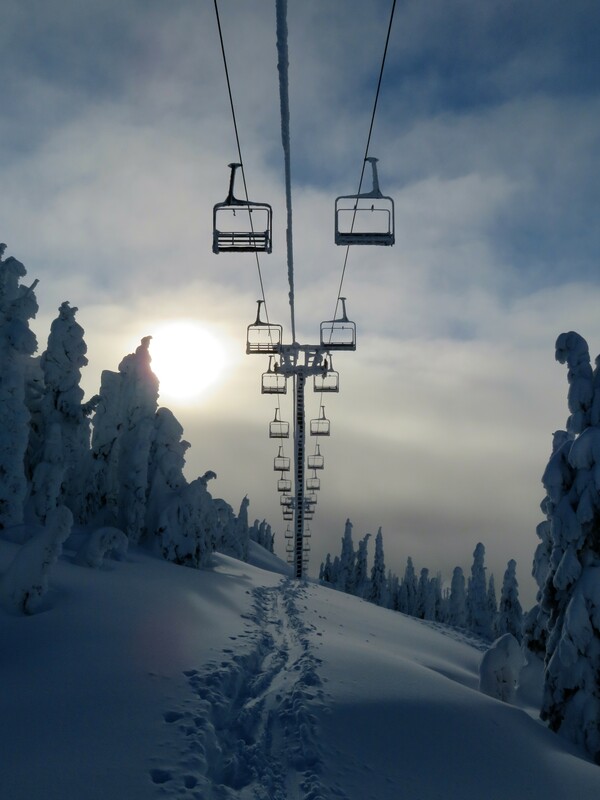 That changed in 1999 and 2000, when the the Bigfoot and Sunrise T-Bars joined the Whitefish fleet just as consolidation and new technology were making new lifts increasingly expensive. In 2002, the ski area acquired a Hall triple for a new beginner lift. Continuing the pattern, Big Mountain, as it was then still known, snagged Moab’s failed Skyway experiment for another new beginner pod. When the first-generation Glacier Chaser detachable needed to be replaced the following year, Whitefish had no choice but to go new for the flagship Big Mountain Express. But instead of scrapping the old Doppelmayr, it shifted west to become the Swift Creek Express. That summer’s lift shuffle also turned the old Easy Rider triple into Elk Highlands, a real estate egress lift. In 2011, the Bad Rock lift was brought in all the way from Pennsylvania and now runs out of the base lodge in both winter and summer. 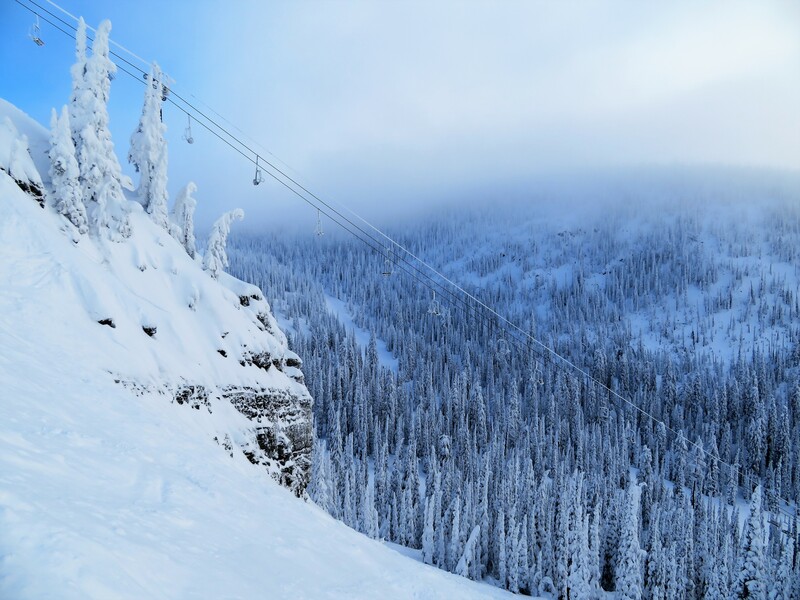 With a major lift renewal complete, Whitefish set its sights on expansion for winter 2014-15, opening the Flower Point lift and 200 additional acres. That machine came from across the border, the old Rosa triple from Kimberley (and the predecessor to the Whistler Village Gondola before that.) 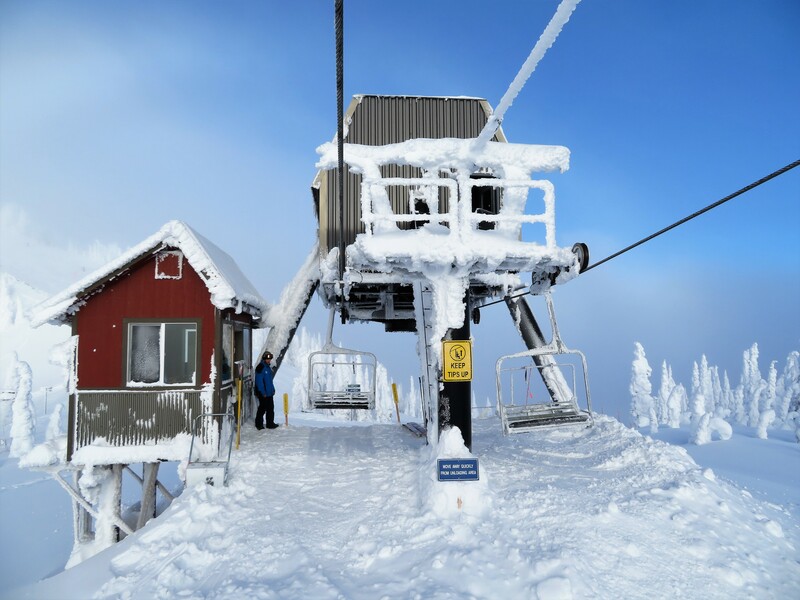 To summarize, Whitefish impressively built “new” lifts in 1999, 2000, 2002, 2006, 2007, 2011, 2014 and now 2017. This morning’s scene on the East Rim. Announced a year ago yesterday, the East Rim project proves a used lift doesn’t have to sacrifice quality or functionality. With a staff including CTEC veterans, Skytrac was chosen to move Glacier View and upgrade components at the same time. Galvanized lifting frames and catwalks were added to the 13 towers to be reused. The counterweight was swapped for a hydraulic tensioning system. Custom safety bars joined the chairs and the top drive terminal got a new electric motor, drive and brakes. The operator houses and controls are all-new. The new 5 is only 2,388 feet long but with its puckering pitch, skis much bigger. It ascends 805 vertical feet in just six minutes with most of the rise packed between towers 3 and 7. 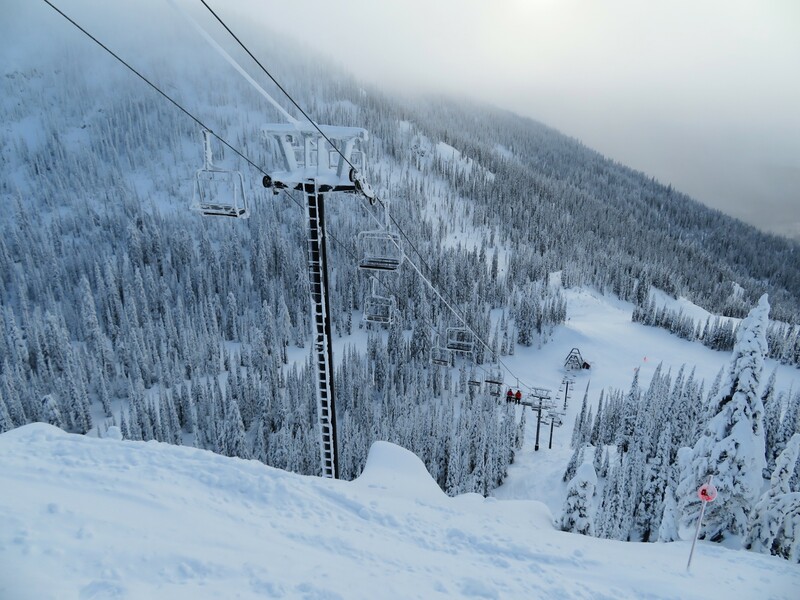 Whitefish spent approximately $1.2 million on the East Rim project, around half of what it would have cost to built a new lift. Most riders will have no clue the underlying steel is 35 years old. Prior to the move in Ptarmigan Bowl, Chair 5 didn’t run a single day in 2015-16 or 2016-17 in what some would call a ‘vertical boneyard’ situation. 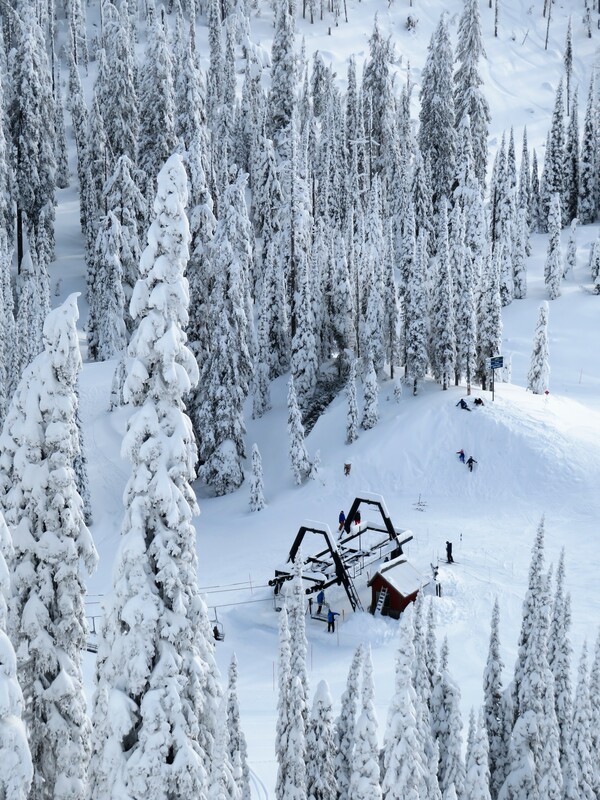 Whitefish sacrificed a seldom-used backup lift for a sweet new ride over terrain many had previously not known to explore. Like we’ve seen nationwide, the era of keeping redundant lifts around is mostly over. 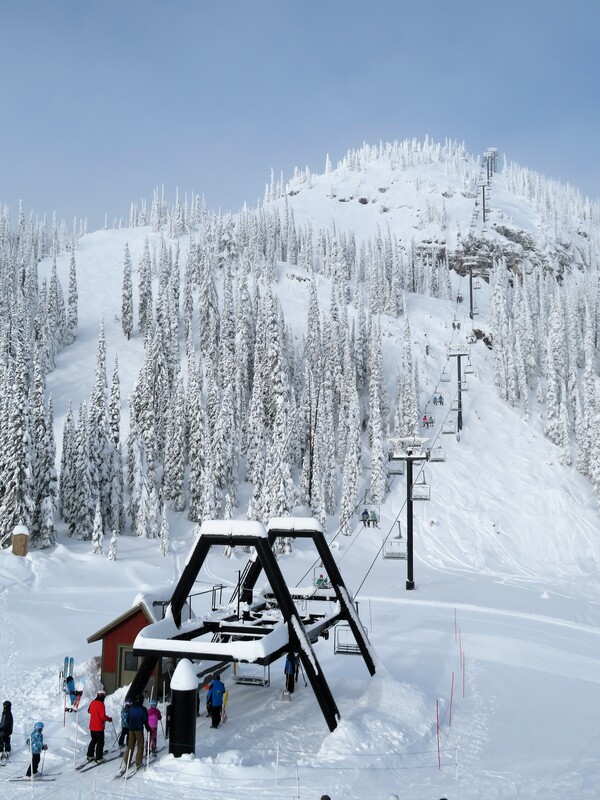 Rather than scrapping a lift with more years of useful life, Whitefish opted to create a whole new upper mountain pod that proved itself on opening day this season with a rare downloading required situation. Saving money on lift projects where it makes sense has also allowed Whitefish Mountain Resort to recently build beautiful new lodges at both the base and summit and the company just enjoyed its best holiday ever. Now 70 years in and with yet another sweet new lift, 2018 would be a great time to head for Northwest Montana to check out the East Rim. 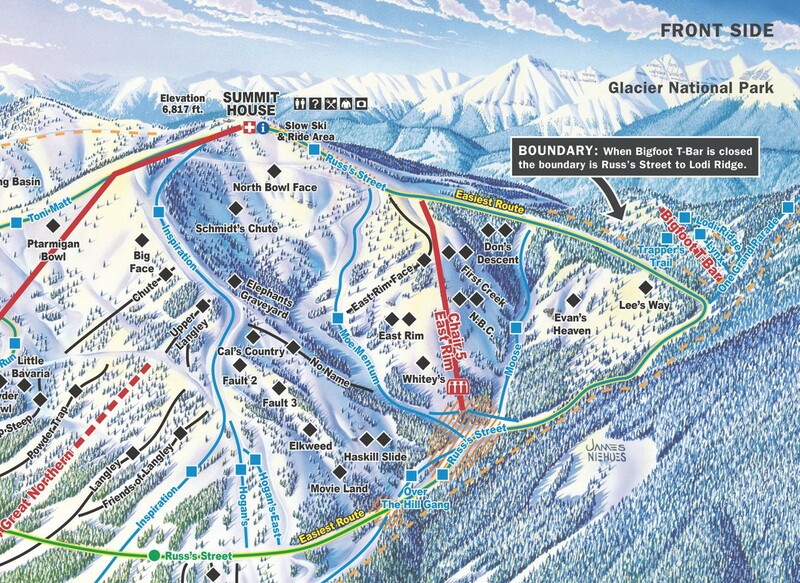 From the trail map, it looks like you might be able to still get to chair 5 from chair 4. If this is the case, chair 5 can still serve as backup access to the backside if chair one breaks down, just in a MUCH more useful alignment. Google Earth has the elevation at the top of 4 as 5,955′ and the bottom of 5 5,790′ so it might be possible with a pretty gnarly traverse. Great Northern wasn’t open yesterday or I would have tested it out. Considering it wasn’t running in the middle of a holiday weekend, it will be interesting to see what the future holds for the Stadeli. The Heritage T-Bar also wasn’t spinning. -You cannot get to the new location of Chair 5 from Chair 4. -Chair 4 runs on Saturdays and some holidays. YES!!!! Please extend chair 4 back up to inspiration ridge please! 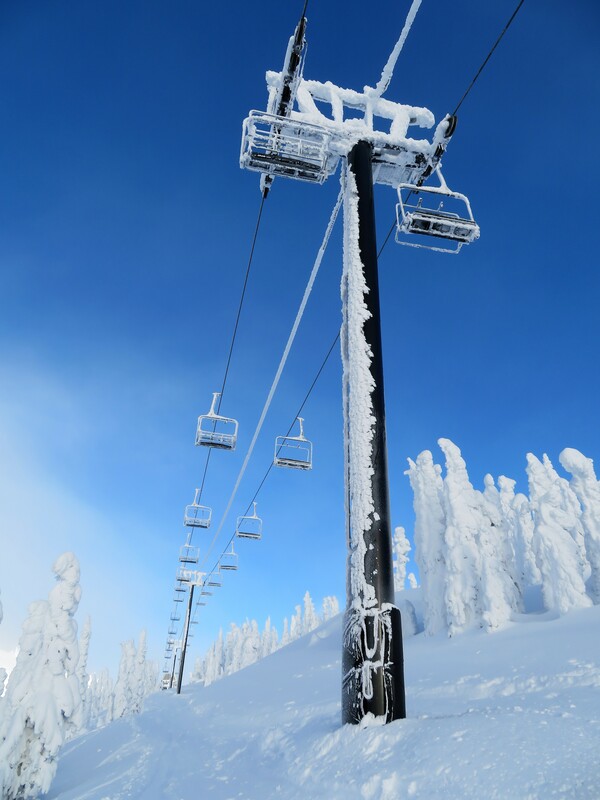 where are american ski lift accidents tracked and hiw are they monitored year on year? How is the 17/18 season fairing? This story reminds me of the Green Peak Triple at Waterville Valley, NH. That was also a lift that has been redundant for 25+ years, and now, since its relocation to Green Peak, has become an important lift in Waterville’s lift system.